(1) Celebrating the fact we've had our first proper meal in days. 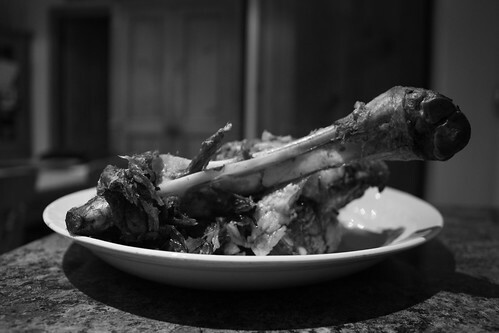 (2) Feeling as manky as the carcass of the roast lamb. Heh, I now realise why people find 'year in pictures' projects so difficult... it wasn't til I just went downstairs to get coffee that I was finally inspired. I thought the roast lamb looked like something H.R. Giger would paint, and if I had more time I'd have played around with it a bit more. But I like this picture.